Have you tried fairy playdough? It’s simple and fun with just two ingredients: cornstarch and conditioner. Big Brother played with it all afternoon. Mom Kate at LaughingKidsLearn.com shared the recipe. In a bowl, mix 1 cup of inexpensive hair conditioner and 2½ cups of cornstarch. 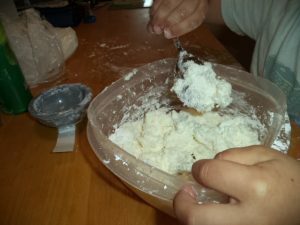 These are approximate measures and you may need to add a little more conditioner if it’s too powdery or a little more cornstarch if it’s too sticky. At first, it seems as if the two things will never mix to make a dough but keep stirring. Once it started to clump together, it was much easier to knead it smooth. Big Brother wanted a lump right away. He wasn’t really interested in rolling, smooshing, or making a snake. He squeezed a bunch into a sort of ball, made another one, and then more. He ended up with quite a line of balls and because there was less of the play dough left, the balls got smaller and smaller. In the craft drawer, there was an assortment of sequins. He choose a sequin and carefully placed it on top of each ball. Then he talked about what he had done and named each shape. 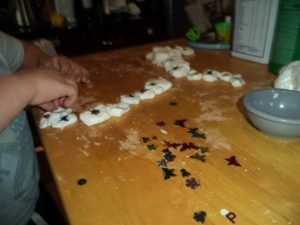 When I asked if he would like to mix all the balls and shapes together, he said no and instead chose to poke the sequin into some of the balls and bury them. We took a break to give Baby Brother a snack. The playdough dried and was a little powdery when he came back it. Since it needed a bit more conditioner, we took the sequins off and mixed in only a couple of drops. This time, Big Brother made it all into one big lump and hid some fairy rocks underneath and inside. The fairy rocks were flat, glass marbles. He called it his fairy rock hideout and like to flip it over to show the rocks. Two friends came over to play. Now, there were three boys playing with the fairy rocks and fairy playdough. They brought some pipe cleaners we used too. We decided to try a few drops of food coloring to see how that worked. Red was the choice. Red added to white makes pink, but Big Brother said red and pink were his favorite colors. All three boys happily played with the pink fairy playdough until Little Brother woke up from his nap and we went outside. Our hands were sure soft from the conditioner. Good thing, because the next activity was digging in the dirt for more hands-on fun. 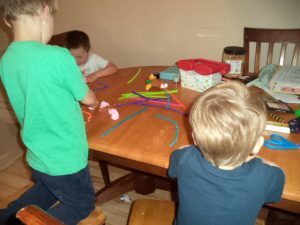 Does your child enjoy playdough play? Come back again tomorrow for another fairy play-of-the-day. If you need a formula for magic, combine art, manners, kids and imagination. This month, people who work with kids are sharing their wishes for programs like preschool and kindergarten. Both moms, Nicolle and Catherine, wanted more hands-on activities and Nicolle had a suggestion. 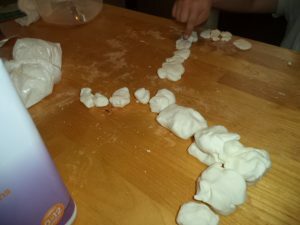 Not just play dough, how about a clay station? 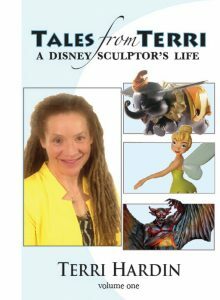 The word clay reminded me of a friend Terri Hardin, a Disney sculptor. In her book, she writes she was “Constantly creating and always in motion….” Doesn’t that sound like kids too? Always on the go with minds thinking and bodies making. Even when kids are taking things apart, they are still creating. Terri also wrote about why clay was so appealing to her. We live in a 3-d world. Sculpting is creating in 3-d while drawing is trying to squeeze three dimensions onto a 2-d paper. There are other differences too. 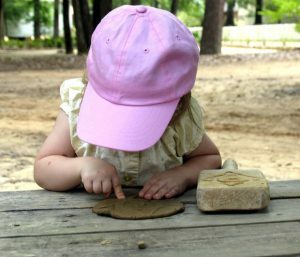 While both use imaginations, clay is far more sensory for hands than paper, paints, and crayons. Kids can really dig their hands into clay. No wonder a clay station is a wish for children’s care programs and school. Often on this blog, I’ve written about the critical importance of social skills for children’s development. The goal of the show is something we all want, “If we teach appropriate behavior and social tolerance during these years, we can create a safer social and school environment.” This is surely something we all want. Isn’t it wonderful to have a wish that can come true? Part of the appeal of any holiday is doing some things again every year so, for a play-of-the-day, how about some kids valentine play dough fun? It’s hands-on and hands-in. To make slime, first mix 1/2 cup of warm water and 1/2 cup of white glue. We popped several cinnamon candy hearts into the warm water and waited for them to turn the water a lovely red. Most of the hearts melted leaving only a little bit of the candy center to take out. When we added the glue, the red water became light pink. In a second bowl, mix 1 teaspoon of borax and 1 whole cup of warm water. Get ready for the next part, which changes very fast! Now, pour the gluey stuff into the clear water/borax and stir. Right away, the two solutions combine to make a polymer. There will likely be some extra water in the bowl which you can just pour off, leaving the wonderful goo. 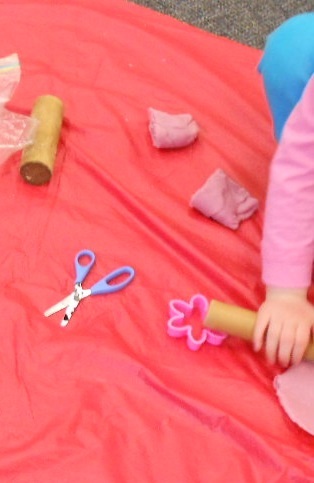 higher level thinking skills, such as planning, problem-solving, imagining and creating. Children are using more than their hands to play. They are also expressing themselves and how they feel. 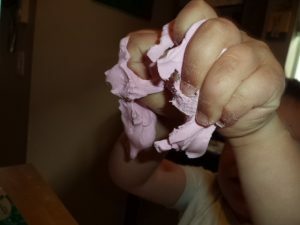 Playdough or slime can help children release pent-up emotions and tensions. The world isn’t always a friendly place for kids, and with these materials, they can feel more in control. Slime adds an unexpected element, because it’s so much more flexible. Even though this can be a little bit frustrating, it’s also exciting. Kids soon learn that cookie cutters will not work with slime, like they do with playdough. 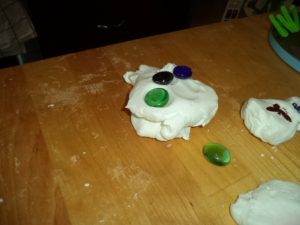 Play dough activities can happen at any time of the year, not just for special events and holidays. 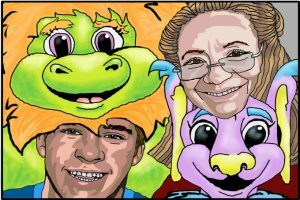 They appeal to kids of various ages and interests. Not all kids will want to make valentines, flowers, or hearts; some like to make dinosaurs and volcanoes. Kids get to create whatever they want to suit their needs and ideas. 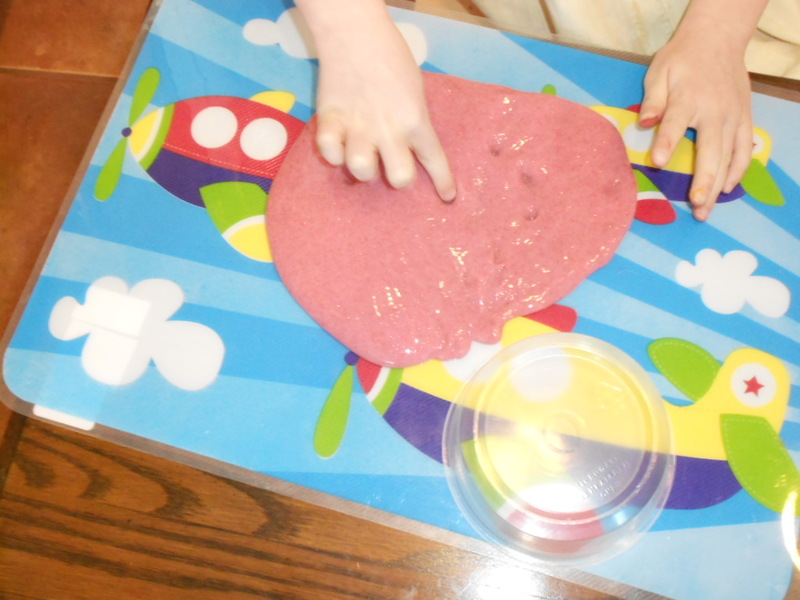 Can some kids valentine play dough fun be part of the action? Halloween Play Dough Fun For Little Ones – What a Treat!